Aside from Valentines Day, the month of February is also the celebration of Philippine International Hot Air Balloon Fiesta. It gathers aviators from the Philippines and the world. The event will be held on February 11-14, 2016 in Clark, Pampanga. This annual balloon festival features lots of hot air balloon in different forms, aerobatics, skydiving, paragliding, remote control aircraft, kite flying and other interesting outdoor activities. Tickets will be available at the Air Ads Hangar, Andrews Avenue, Pasay City, or through the online ticketing portal via www.philballoonfest.net. You may call them at 8512450 during office hours (9AM-4PM). You can also get tickets through TicketNet Online and selected TicketNet outlets. as well at the Fiesta entrance. Gates and ticketing counters open at 5AM daily. For those who will avail VIP tickets, it includes complimentary use of the Balloon Launch Patio, Air-Conditioned Lounge, breakfast and lunch buffet, afternoon tea and complimentary snacks and beverages. Senior citizens are entitled to a 20% discount (present senior citizen card) while children below 3 feet can enter for FREE. From Metro Manila, take a bus going to Pampanga. Bus terminals (Victory Liner and Philtranco) is located in Cubao Quezon City. Get offat Dau Terminal, Pampanga. From the main gate, take another jeep going to the main venue. If you want to stay overnight in Pampanga, there are couple of hotels, Inns and Lodges near the venue. Please make sure you book as early as now. 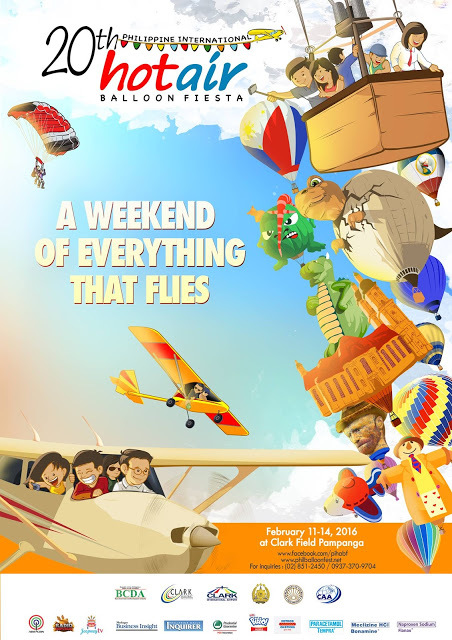 Mark your calendar now and join us on February 11-14, 2016 at Clark, Pampanga for a weekend of everything that flies! Get your tickets online now!